HCM City (VNA) – The southern economic hub of Ho Chi Minh City is building particular policies to achieve more rapid and sustainable growth in the future. 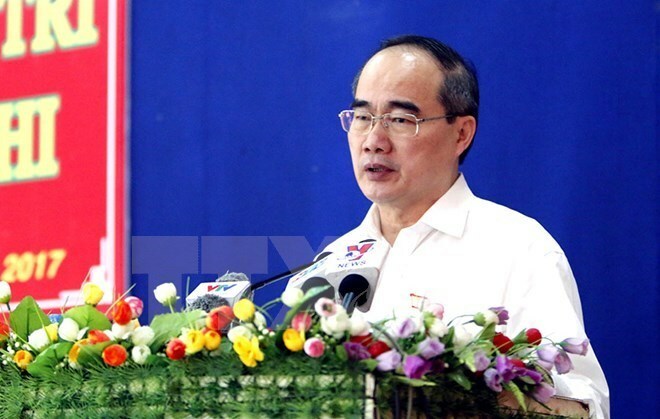 Secretary of the municipal Party Committee Nguyen Thien Nhan was speaking at the 11th meeting of the city’s Party Organisation (10th tenure) on August 18. He highlighted the significance of the event as it is a time to evaluate the implementation of the Resolution adopted at the 10th Congress of the municipal Party Organisation as well as seek solutions to fuel economic growth. The city will map out three detailed plans to realise three resolutions on economy approved at the fifth plenary meeting of the 12th Communist Party of Vietnam Central Committee from now to the year’s end, he said. Besides achievements over the past five years, HCM City needs to address some shortcomings in economic growth and infrastructure development, he added. During the two-day conference, participants will discuss a project building HCM City into a smart city in 2017-2020, with a vision to 2025 and hear reports on developing private economies, improving the institution of the socialist-oriented market economy, and restructuring, reforming and improving the operational efficiency of State businesses.